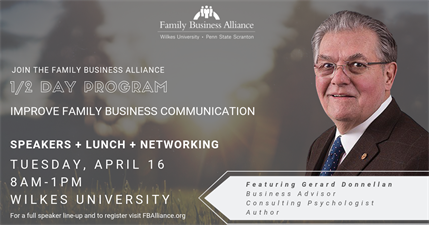 Join us on April 16 for an amazing opportunity to talk about key components of family business, communication and planning. This interactive experience brings together a group of professionals each one being a special type of problem solver. Your participation will provide you with several takeaways and opportunities to plan for the big picture of your family business. Every family and business has unique challenges which can benefit from improving group communication skills. We will discuss practical solutions and listen to stories pertinent to family businesses. This is an opportunity to listen and learn from experts in communication, business planning and the essential combination of the two.